The sharp gyrations of the stock markets on Friday after the Infosys results will confirm a commonly-held myth that markets reflect underlying economic reality. Most Indian experts tend to believe that what applies to the New York Stock Exchange and its relationship with the US economy automatically applies to our stock market and the Indian economy. Put another way, we tend to believe that the stock market reflects the state of the Indian economy. This is why the finance ministry goes out of its way to woo the market in the hope that if the market is happy, the economy will be too. Let us look at some of the assumptions regarding our market and check how true they really are. Proposition 1: The listed corporate sector is critical to the economy and has a dominant role in it. The National Accounts Statistics (NAS) bifurcate sectors into organised and unorganised. All things labelled unorganised are non-corporate organisations even while a large part of what is called organised comprises proprietorship and partnership firms. The corporate sector is a small part of what is called organised. In fact, it is the non-corporate sector (see Table 1), comprising partnership/proprietorship firms, which has the largest share in our national income (nearly 50 percent), followed by agriculture (17 per cent) and government (20 per cent). Incidentally, in activities like trade (wholesale and retail), transport (other than railways), construction, and hotels and restaurants, the share of the non-corporate sector is more than 70 percent. The share of the corporate sector in our domestic savings is less than 5 percent. In contrast, in the developed countries it is more than 50 percent. The largest component of our savings (more than 80 percent) comes from the household sector, which includes all partnership/proprietorship firms even if they are in manufacturing or trade, transport, construction or hotels. Hence the proposition that the corporate sector is critical to our economy is not borne out by facts. But it is repeated ad nauseum, since such is the case in the UK and the US, and one begins to think that this is so for all countries. So proposition 1 is neither true nor valid. We have nearly 7.2 lakh companies incorporated under the Companies Act (as in 2011) and more than 9,000 scrips (shares and bonds) of 5,000-and-odd companies are listed on the stock exchanges. Of these, only 3,000 or so are traded at least once a year; and only 100 or so can be considered as active shares. Some 50 shares constituted nearly 65 percent of the market. Though market players and exchanges brag about India having the largest number of listed scrips (like having the largest cattle population in the world), only about 100 are active. More than 70 percent of trading, even in these scrips, is not for delivery. It is for trading and squaring-off purposes. In other words, market participants do not ever own these scrips – they merely use them for speculation. So even proposition 2 in invalid: the stock market is no barometer of the Indian corporate sector, leave alone the Indian economy. Proposition 3: The stock market helps channel savings in our economy. This is the most amusing assumption of the lot. At best of times, the primary market has garnered some savings from the public through initial public offerings, but more often than not, the money ends up in stocks linked to the Oswals, the Bhansalis, the Mehras, the Deepaks, the Ruias and Mallyas – not to speak of hundreds of other entrepreneurs who have managed to destroy the value of people’s savings. The value-destroying list is long, and those interested can go through the business journals of the last 20 years (particularly the cover stories) that detail how these “whizkids” and “visionaries” were going to build a modern, industrialised India. The savings data (Table 2) suggest that the share market has very little to do with channelling people’s savings into productive investment. At best of times (for companies, not investors), the proportion of “shares and debentures” as a percentage of household financial savings was 5 percent in 2009. In 2011, it was less than 1 percent. A large chunk of our investors prefer to invest with banks, post offices, provident funds and life insurance funds. So proposition 3 is also bogus: the stock markets play a very small role in the economy or in funneling savings; the share of the non-corporate sectors is significant. Proposition 4: Foreign investments are critical to our growth story. This is the most believed wisdom. 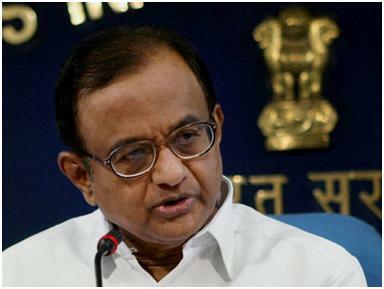 Look how P Chidambaram has been going on road shows to lure foreign investments. But the evidence suggests that our growth is due to our domestic savings, particularly household savings. 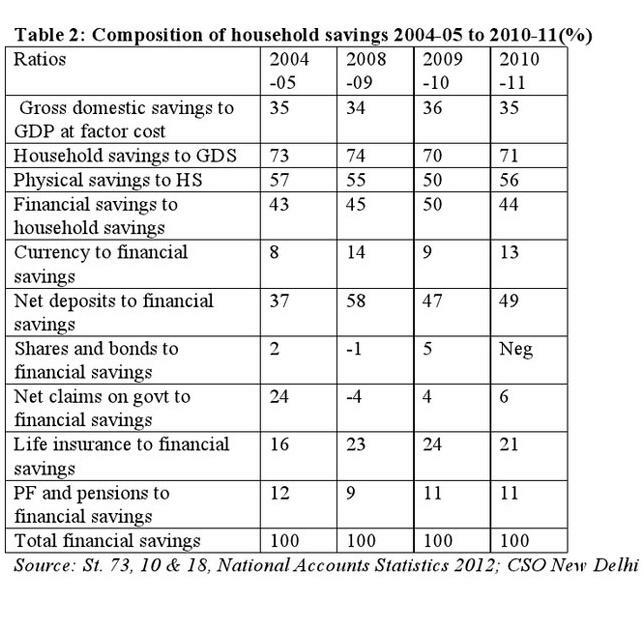 Our savings rate two years ago was around 34/36 percent of GDP and more than 70 percent of this was household saving. FII and FDI inflows were always less than 10 percent of our investments, and if at all anyone should be appreciated for our growth story it is our households and the average housewife. There is a story of Lord Vinayaka (Ganesha) and Subramanya competing for a mango by trying to go around the world in the shortest time. Subramanya got onto his peacock and went around while Ganesha just went around his parents, Shiva and Parvathi, treating them as the Universe. He was given the mango. Our Finance Minister knows this story – I am sure – and so instead of wasting his time in Frankfurt and Tokyo, he should focus on Indian housewives and help them balance their budgets by reducing inflation and the fiscal deficit. Unfortunately, our housewives do not have access to the Nashik note printing press like our FM. The solution to India’s problems lie inside, not in wooing FII/FDI inflows. But as long as our economic thinking is tied to Oxford/Harvard/Yale/Chicago “wisdom” we will continue to call the largest segment of our economy – namely partnership/proprietorship firms – as “residual” and go around the world with a begging bowl to request companies to invest to India. The stock market is important to 10 percent of the economy and it cannot be categorised as a barometer of the economy. Even if the entire corporate sector vanishes, the national income will only drop by say 10-12 percent. Incidentally, our national income is underestimated by at least 30 percent and to that extent there is no loss at all in the total picture. In that case, how do we assess growth in the economy? Quite simply, you should peep out of the window. I mean the real one. If you find lots of economic activity unrelated to the Sensex thriving and flourishing, then the economy is growing!! Excellent food for thought. Very good insight. Simple approach but true. Quite interesting reading this article. Indeed it is the activities on the street that speak for itself as to how far we are!!!!!!! I TOTALLY SUBMIT TO THIS THEORY.THIS IS WHERE SUCCESS IS.